Under the current permit, a 151-acre lake will be created within a park-like site totaling approximately 218 acres. 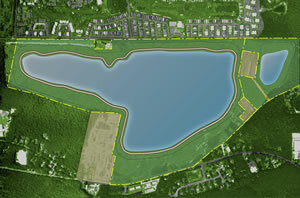 Upon completion, the lake will be to a depth of approximately 110’ and will be stocked with freshwater fish. When the lake and its buffer zones are completed approximately 218 acres may be offered to a public entity for public access and recreation. The lake is designed to incorporate a permanent perimeter roadway to provide access around the lake. As current sand mining continues in each phase of operations, the side slopes continue to be graded and stabilized, and native vegetation to be selected from recommended species lists provided by the NYS Department of Environmental Conservation and the Central Suffolk Pine Barrens Commission will be established on those slopes during planting seasons, and allowed to naturalize over time. 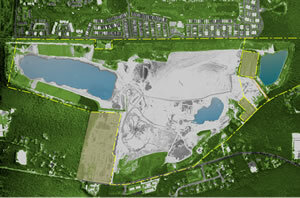 As each area of the lake is completed, a 150’ wide protective area is established around the lake’s perimeter. This protected area will consist of a 100’ wide vegetated buffered area, a 30’ wide perimeter path with drainage swales, and a 20’ wide vegetated “no-disturbance” area around the waters edge. While future permit applications may request some final modifications to the configuration of the lake, the reclamation objective will remain a lake that will provide fishery habitat protected by a vegetated buffer around the lake. To protect water quality, there will be no use of pesticides or fertilizers in these areas. Selected use of heavy vegetation in these areas will also deter the geese from uprooting any vegetation. Vegetation on the side slopes will continue to naturalize and a fish habitat will be established to promote breeding and a self-contained ecosystem. The lake will be stocked in accordance with NYSDEC Fish & Wildlife recommendations. Water quality monitoring protocols will be continued.